My friend Bill Prosser over at the outstanding Literate Lives blog just read and reviewed my new book, Justin Fisher Declares War! Ha! Actually, Bill created a photo mosaic inspired by the book and I thought it was a very clever, creative response to a book with some real pedagogic potential. In the comments section, Bill explained how he did it, so I thought I’d share that with my Nation of Readers (see below). Bill is an old school guy, meaning that he’s hopelessly stuck on books, but by dint of effort he’s forced himself, admirably, to keep apace of technology. While I personally remain averse to Twitter (Bill just took the plunge into the Twitterverse — Ashton Kutcher, watch your back! ), I do think he hit on something with this mosaic concept. Bill’s been happily making a few based on some of his favorite books (Savvy, Make Way for Ducklings, and more). Check out this post, “Some Tech Stuff for the Summer,” for the glorious details, cool images, and happy links. Great review, Jimmy! And I love the mosaic. 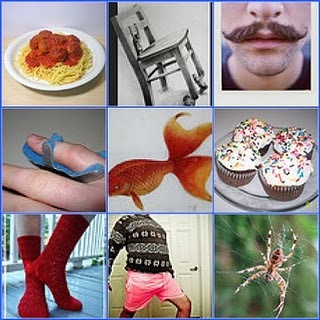 Where else do you see a finger splint alongside spaghetti and meatballs?